2. 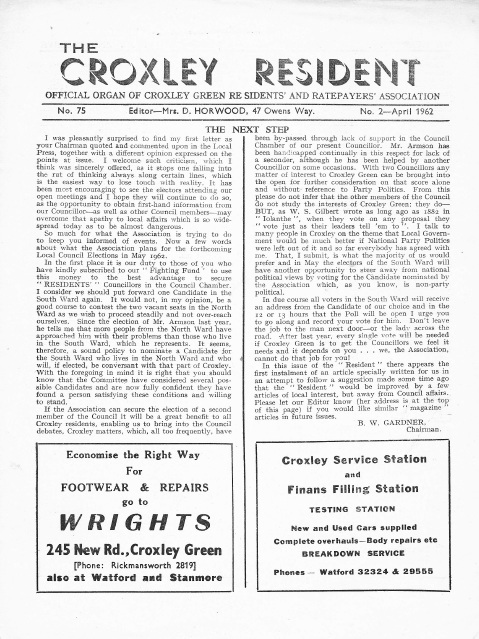 That this Sub-Committee be instructed to discuss with the Croxley Green Society the NEED for a Public Hall and methods of FINANCING such a building if there was found' to be a need. Party Line", as is done at present. 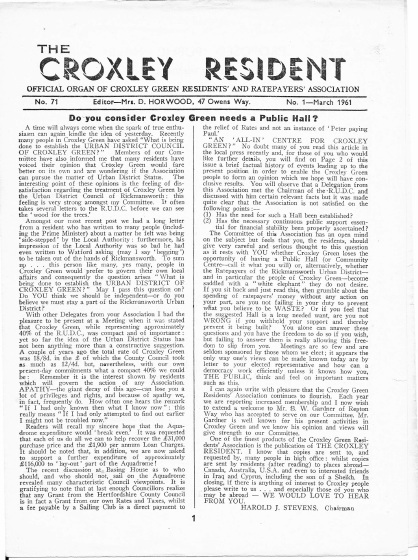 I am sure Mr. Armson has the interests of Croxley Green at heart in a very high sense. I have known him for some years now, and have watched his work on the committee of the Residents' Association both as its Chairrnan and in committee, where his work has been excellent. 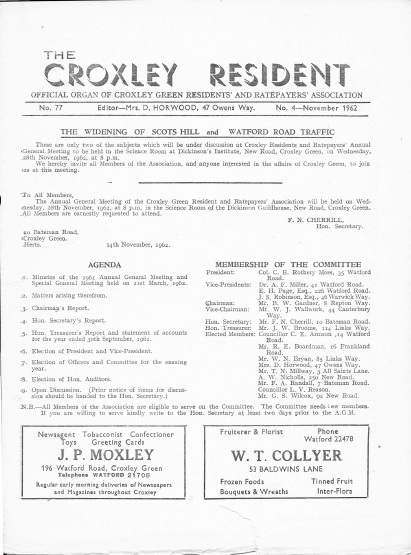 Nothing is too much for him to do in the interests of Croxley, and his knowledge of Council affairs is great. I am told that he has not missed one Council meeting in the last four years, which does show his in terest in local affairs. He is the" soul of integrity", honest, straightforward and not afraid of voicing his opinion in a forthright manner. 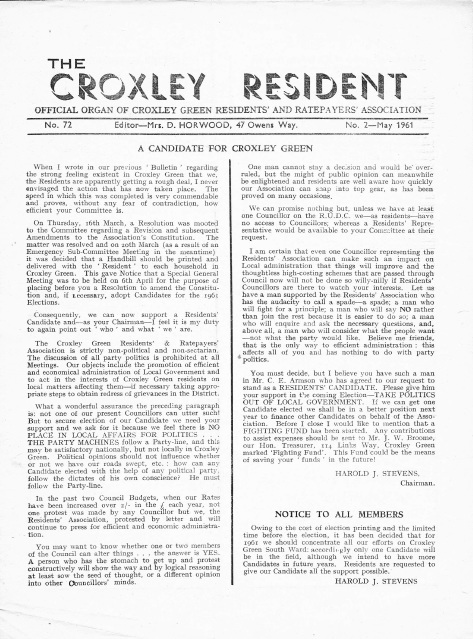 Let us cut out Party Politics and VOTE for ARMSON the Croxley Green Ratepayers' Association chosen candidate. Permission has been granted for the conversion of existing garage into a consulting room at 268A Baldwins Lane, Croxley, for Drs. Ferguson, Pitt and Hodgson, providing· the whole of the land within the curtilage of the site, which is between the front of the building and Baldwins Lane shall be made available as a parking space for vehicles. This is to ensure that vehicles can be parked off the highway and so prevent obstruction to passing traffic. A special panel has been set up by the Council to enquire into the traffic conditions of Watford Road between All Saints Church and the Metropolitan Station. It is hoped the Panel will have regard to the further part of Watford Road in their deliberations, because conditions throughout are little different. Four accidents occurred in a 100 yard stretch of this road in a period of 10 days. 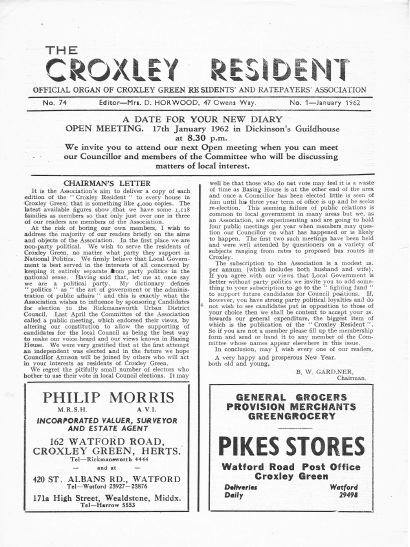 The Residents' Counsellor, Mr. C. Armson, who lives in this vicinity is to serve on the panel and residents in Watford Road who can offer any evidence towards the appraisal of statistics are invited to send a note to the Hon. Secretary. 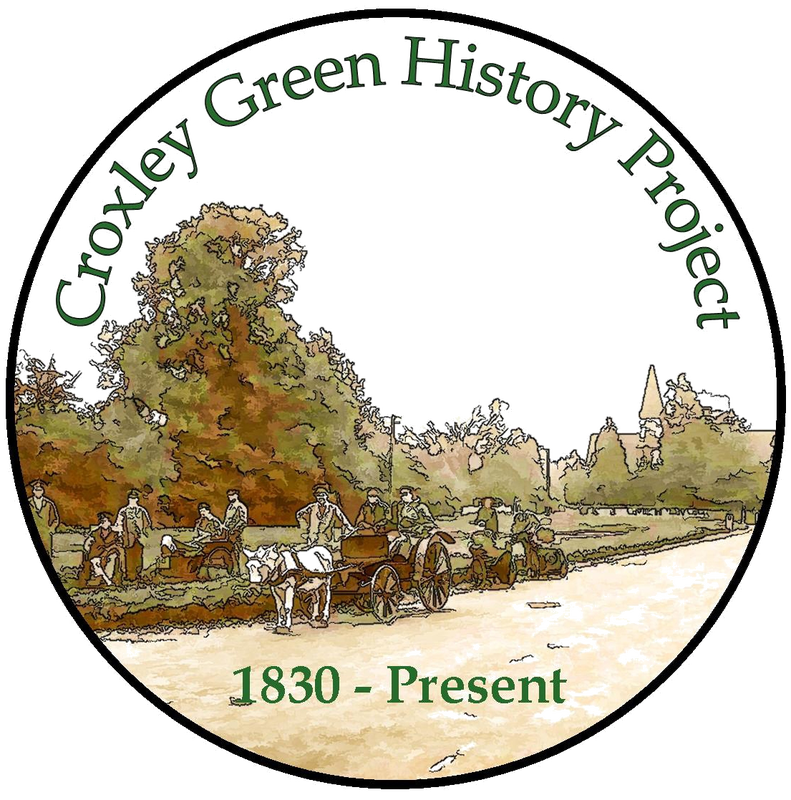 Not for much longer will pedestrians have to wade through the mud of the Green, for it is proposed to extend the footpaths on each side of New Road across the width of the Green to link up with the existing transverse footpath along the main road of the Green opposite the War Memorial. with New Road would become a new danger spot, so we were more than pleased to see the Council agree with a suggestion of ours that a " Slow-Major Road Ahead" sign should be erected, and so speedily erect it. enlarging the existing soakaways, or providing new soakaways. When is this improvement coming? . (Quote) "As and when sufficient funds are available out of the allocation made for this type of road." believe me we know it. Invariably what they want, the Council want, so between the two we sometimes get things done." The words are his, the italics are ours. Help the pedestrian is our cry in seeking to have the pedestrian crossing re-sited a little further west of Croxley Green station. With the complete renewal of Cassio Bridges in the near future we hope this will be effected in the general improvements. consisting of the Chairman, Secretary, CHr. Armson and Mr. Leach, discussed future developments with ClIr. Gilbert Longden, M.P. At his suggestion, answers to technical questions are being obtained from the Valuation Officer, and will be published when known.Concerning' Income Tax, the Inland Revenue say that no change is expected in the present basis of assessment for income tax. 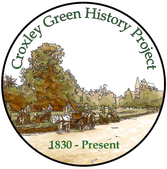 Caravans - Rickmansworth Council soon made it clear that they will not tolerate infringements of Town Planning laws, and consequently notice has been give to stop the display of caravans on a site in Watford Road. 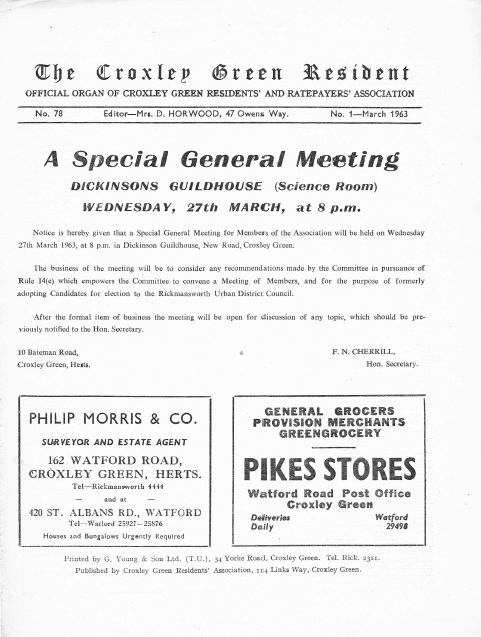 These are only two of the subjects which will be under discussion at Croxley Residents and Ratepayers' Annual General Meeting to be held in the Science Room at Dickinsons Institute, New Road, Croxley Green, on Wednesday 28th November, 1962, at 8 p.m. We hereby invite all Members of the Association, and anyone interested in the affairs of Croxley Green, to join us at this meeting. A world film premiere held recently in Croxley Green was attended by many parents at Durrants School. The all-colour and sound film "The Boy who walked backwards" is the very latest production of the Durrants Film Society. Not only did the pupils take the leading roles and act as extras, but all the shots were local. It was most pleasing to see Meads Autos and the Fox & Hounds in colour. In the same programme was shown the entry which secured a highly commended tag in the National Film Awards, namely" Fits and Starts". This film was quite a masterpiece of colour and sound, the colour being blobs of various dimensions, and the sound derived from such every-day articles as washing machines and motor scooters. A very commendable effort which deserves showing again at an early date and which should command high box office returns. F.N.C. helpers to compete with the Political Parties who have access to bigger purses and more helpers than we have. I feel confident that an all-out effort can be crowned with success if we have more hands to do the work. No offer of help will be declined, no matter how modest. Please communicate with the Secretary at 10, Bateman Road. lavatories will be built this year", and the School has been visited by County Architects who are drawing up plans for two blocks of indoor toilets, one on each side of the school. We must keep a watchful eye open to see that these promises are not postponed. 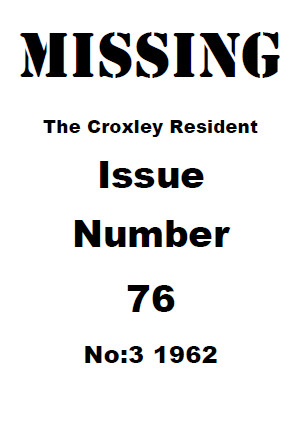 covered with deep crevices, and the surface of the Zebra Crossings of Croxley need inspection. 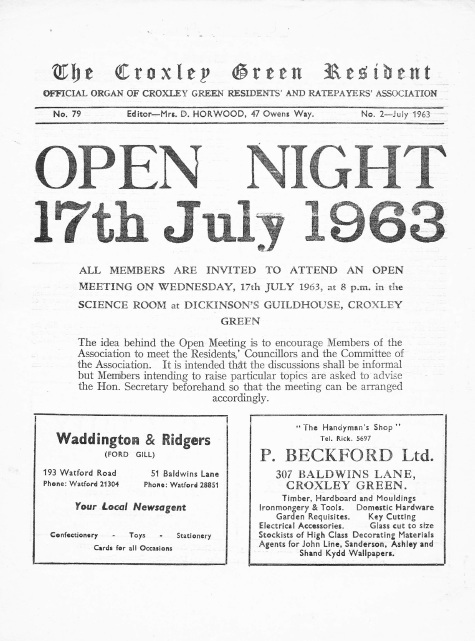 The idea behind the Open Meeting is to encourage Members of the Association to meet the Residents,' Councillors and the Committee of the Association. It is intended that the discussions shall be informal but Members intending to raise particular topics are asked to advise the Hon. 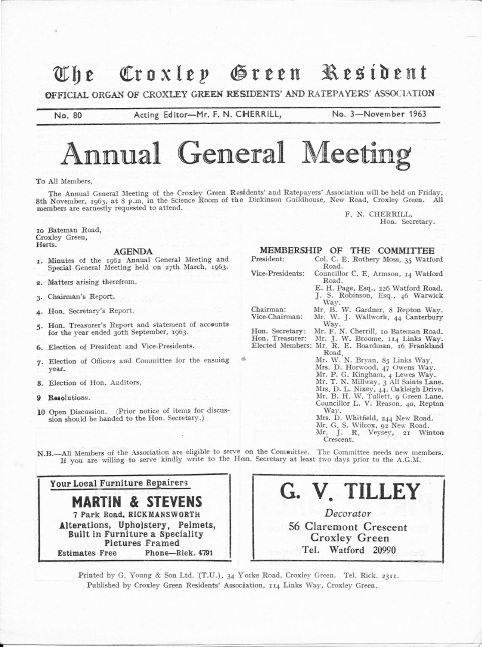 Secretary beforehand so that the meeting can be arranged accordingly. To Mr. D. J. Taylor who has recently taken up the Headmastership of Durrants Secondary Modern School. The tallest chimney at Dickinson's factory. Cllr. 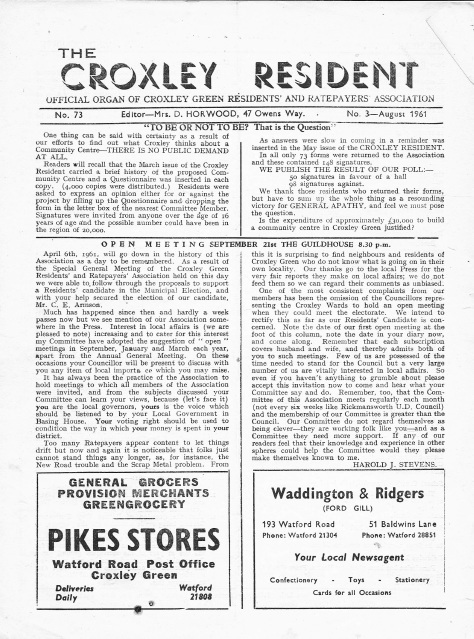 Whiteside placed a lengthy statement before the Council regarding the standard of environmental and personal services which present-day ratepayers have a reasonable right to expect, citing serious weaknesses and deficiencies in such services which, he thought, were not wholly the fault of factors beyond the control of the Council to implement the Council's policies. Each working Committee of the Council will consider the matter. This Association would be glad to have a note of any overdue job having the Council's responsibility, as, for example, the footpath along Watford Road. The Association has complained ef the terrible state of this unmade read, by which many children go to school. So that the present character of this lane is preserved the Council will continue to carry out; such patching works as are necessary.